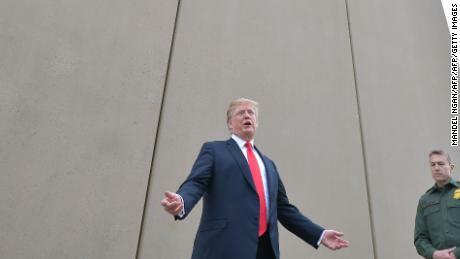 Poll of the week: A Fox News poll finds that 56% of voters are opposed to President Donald Trump using a national emergency to build a wall along US-Mexican border with congressional approval. Just 38% approve of such a maneuver. Other polling, including CNN’s, has been even worse for such a move with approval generally in the low 30s and disapproval in the mid 60s for using a national emergency to build the wall. What’s the point: After a disastrous government shutdown over a border wall for Trump’s approval ratings, Trump was seeing improvement. A Gallup poll out this week showed his approval rating at 44%, for example. It’s the type of movement Trump will need to see going forward in order to have a good chance at re-election in 2020. Earlier this week, it seemed like the President was going to heed the lesson of the shutdown. He was going to sign a spending bill without funds for a border wall, the construction of which remains unpopular. Instead, Trump’s going to declare a national emergency to get his border wall. If Trump was looking to make the smart electoral move, he failed. The President continues to double-down on his base even though there is absolutely no sign that he is losing them. All the while, he is alienating the center of the electorate who he needs more support from ahead of 2020. Look at what happened after Trump ended the shutdown without the wall. His approval didn’t drop among Republicans. It rose with independents. Of course, many Trump supporters don’t believe the polls, even though they should. Still, we can look at the midterms. The results were pretty clear: Republicans didn’t lose voters in the midterm election because they saw Trump neglecting to fulfill his promises on immigration. If anything, Republicans lost voters because Trump was seen as too tough on immigration. Before he tried to use emergency powers to build the wall, 46% of voters in the 2018 exit poll said Trump’s policies were too tough on immigration. Only 17% said they weren’t tough enough. The rest (33%) said they were about right. A move to the right on immigration may end up satisfying those who said Trump hasn’t been tough enough but it would alienate all of the 46% who thought Trump was too tough on immigration and probably some of the 33% who have said that his policies have been about right so far. Trump’s making a risky move to win over voters he’s already won. The Republican Party won about an equal share in 2018 of those who thought Trump was not too enough on immigration (85%) and about right (86%). In other words, the voters who thought Trump wasn’t being tough enough were already voting Republican anyway. Trump, himself, didn’t need to do it to get his approval rating up. His approval rating with Republicans was 90% in the exit poll. (His disapproval was 90% among Democrats.) Republicans were most likely to think he wasn’t being tough on immigration at 29%. Put another way, most of the people think Trump isn’t tough enough are already approving of him. Trump’s trouble, instead, has been with independents and Democrats. His approval rating in the exit poll with independents stood at a meager 42%, which was the vote share won by Republican House candidates among them. Most independent voters didn’t want Trump to be tougher on immigration. Just 16% wanted him to be tougher. A slight majority (51%) actually thought he was being too tough on immigration. Building a wall via a national emergency definitely doesn’t help with this majority and could hurt him with the 33% who thought his previous policies were about right on immigration. As for Democrats, a meager 6% said Trump’s immigration policies weren’t tough enough. This was somehow smaller than the 9% who said Trump’s immigration stances have been about right. The vast majority (84%) of Democrats believe his immigration stances have been too tough. Until Trump realizes it’s not the 2016 Republican primary season when he needed to out-hawk others on immigration, he’s hurting himself politically and in doing so hurting reelection chances.